Last Friday, February 22, 2008, the Timminco Limited (TSE:TIM) subsidiary, Bécancour Silicon Inc. (BSI), announced plans to expand annual solar grade silicon production capacity from 3600 MT (Metric Tons) to 14400 MT in Timminco Announces Expansion of Production Capacity for Solar Grade Silicon. This expansion is slated for completion by mid 2009 at a cost of about $65 million (I presume Canadian Dollars or CAD) and will establish BSI as the leading volume producer of solar grade silicon by upgrading metallurgical silicon (mg-Si). As noted in this BSI presentation at the February 7, 2008, Landsbanki/Kepler Alternative Energies Conference and per Timminco Announces Commencement of Production of Solar Grade Silicon in Its New Facility, their first 1200 MT per year production line has reached nominal capacity and averages about 80% operating capacity since early January 2008. The second 1200 MT line began operation in early February 2008, and the third line was supposed to come online about now. 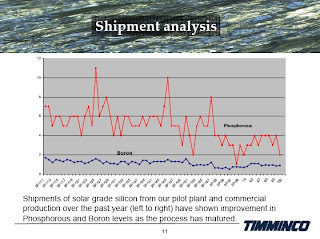 Analysis of the solar grade silicon by shipment shows continuous improvement in Phosphorous and Boron impurity levels. An independent lab (SHIVA Technologies) analysis of BSI’s solar grade silicon from the first production line found concentrations of less than 1 ppm wt (parts per million by weight) Boron with Phosphorous concentrations centered around 5 ppm wt. I heard from an informed source that while some BSI customers blend the solar grade silicon material with polysilicon in a 1:1 ratio, others can produce working silicon solar cells with 100% BSI material. BSI announced four (4) long term customer contracts for High Purity Silicon and sampled 24 customers with 90 MT of solar grade silicon from the pilot plant in 2007. Since then, BSI has purchase orders for 2008 from four (4) new customers and claims the “High quality and cleanliness of material has enabled monocrystalline production”. I have been searching for the patents related to BSI’s Silbec Process. It appears these have been moving forward and may be published soon. René Boisvert, President and Chief Executive Officer, Bécancour Silicon Inc. (Silicium Bécancour Inc.), will be presenting on April Fool’s Day, April 1, 2008, at the 6th Solar Silicon Conference in Munich (München), Germany, as part of the Photovoltaic Technology Show 2008 Europe. All my arrangements are set, and I am looking forward to covering PHOTON’s Photovoltaic Technology Show 2008 Europe this April. In a new Blog personal worst for lethargy, I posted the original Timminco Limited: O Canada! Solar Grade Silicon, Eh? – Part 1 about six months ago without follow up. Good thing the The Real Deal Blog by John Polomny covered Timminco developments per this search label, Stock of the Year Timminco vaults 25% on news.